Sea level rise has major implications for coastal Washington. 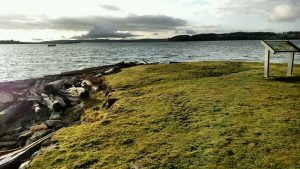 The recent projections released by Washington Sea Grant, WA Department of Ecology, UW Climate Impacts Group, The Nature Conservancy, and other partners predict approximately one foot of sea level rise by 2050, and up to two feet by 2100. Bridget Trosin, Coastal Policy Specialist at WSG, helps people connect sea level rise projections to reality. And in Raymond and Oak Harbor this last January, 70 attendees got a first-hand look at what these projections might mean for their communities. In turn, people could communicate these impacts to decision-makers using the citizen science MyCoast app. These viewing parties are part of Trosin’s work with the King Tides Program, which monitors the extent of very high tides throughout coastal Washington. “We use king tides to communicate the effects of sea level rise and what it will look like in the future,” she explains. 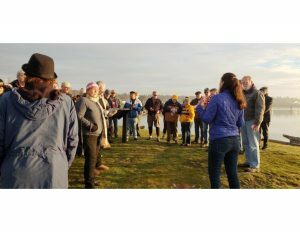 “We invited the public down to the waterfront to talk about what a king tide is, Washington State’s King Tide program, and talk about sea level projections,” she said. The projections that were created for the state take into account the local variability within coastal Washington’s complex landscape. This variability can be due to tectonic plate movement, the shape of the sea floor, tides, weather, and human modifications to the shoreline. So, understanding how these projections will affect local infrastructure and ecosystems is challenging. The term king tide, Trosin explained, describes the most extreme high tides in any given year. Caused by the alignment of the sun, moon and Earth (called syzygy) or when the sun is closest to the Earth (a point called perihelion), these series of unusual tides occur regularly four to five times a year. While king tides are a natural phenomenon, their unusually high extent help scientists, planners and decision-makers visualize how sea level rise will affect communities. With sea level rise, today’s king tides are likely to become the everyday tides across our region, which means king tides provide a real-time window into the future of Washington shorelines. As the king tide came rolling into Oak Harbor, Island County planners were present to show how the recent sea level rise projections are used at the county level. In Raymond, sea level rise projections were derived from NOAA’s Sea Level Rise Viewer, giving the public a window into the future of sea level rise. Tracking the impacts on every shoreline in Washington during a king tide is a tall order. However, the public are encouraged to help in this effort. The MyCoast app enables the public to communicate with decision-makers and help scientists identify effects of sea level rise around coastal Washington. The process is simple: during a king tide (the next tides are set to occur in November), take a photo of a stationary landmark or important location on the water, and upload to the app. Within only a few months of release, there have been 56 reports with over 110 photos from all regions of Washington. All this data will help scientists, planners and community members understand and communicate the effect of sea level rise in Washington. Download MyCoast on either Android or iOS. Captions: Top left: Bridget Trosin (WSG) presents to the public at Oak Harbor. Bottom header: Oak Harbor king tide on January 19.